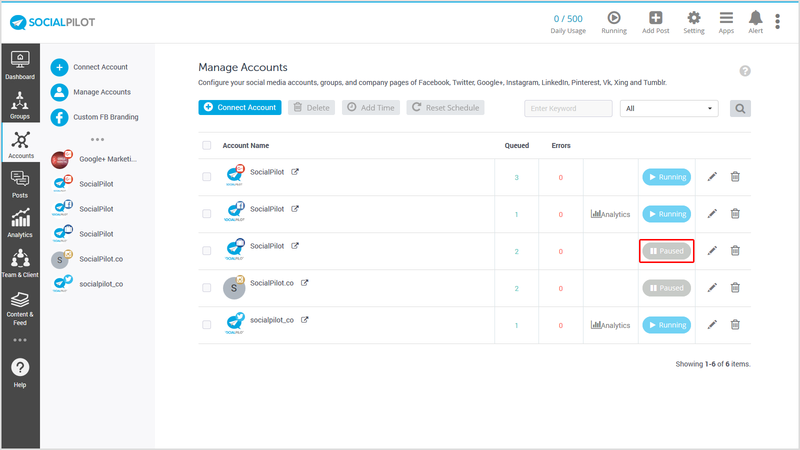 On the 'Manage Accounts' page, hover over the accounts for which you want to pause sharing. Click on the 'Running' button to change it to 'Pause'. All sharing activities of this account will be suspended till you switch back to 'Running'. Note: To stop/pause sharing activities of all your accounts together, click on the 'Running' button in the header panel and turn it to 'Paused'. The pause button helps you to suspend your account activities while you are busy with planning your marketing strategies.